Description: This was the lead engine of the double header up the hill. It's turning at Cumbers before returning to Chama. Description: This was the lead engine of the double header up the hill. It's returning to Chama. 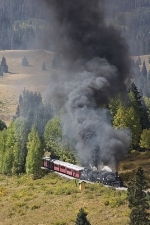 Description: The morning train out of Chama climbs 2,162 feet to Cumbres Pass in 13.5 miles, some of which is relatively flat. So a second steam engine (double header) is added to the Pass.